It’s the meat that gets no respect. It’s considered the “cheap” choice on restaurant menus, and the boring, cook-it-when-you-can’t-think-of-anything-better dinner choice. But add some sauce and spice, pair it with the right bottle of wine, and you’ve got a great meal. But is. Because there’s really only one Tried and True Rule of Food and Wine Pairing. Before I unveil this Guiding Principle, let me walk you through a little case study. Let’s say you’re cooking Chicken Parmesan, with a rich Marinara Sauce and some melted cheese. What’s the dominant flavor? What stands out in your mouth? Is it the taste of the chicken breast, or the taste of the tomato sauce? And if you cook an elegant Chicken Piccata, drizzled with Lemon Butter Caper Sauce, what do you taste? You taste the lemons and capers, if you cook it the way I do. So the dominant flavor of any dish is the sauce or the spicing, not the base meat or vegetable. Aha! Now you see where I’m going. If someone asks, “Which wine should I pair with chicken,” I ask, “How are you preparing it?” If they say, “With Parmesan Sauce,” I go for a red: maybe a lighter Italian red such as Barbera or a Toscano blend; maybe a Spanish Tempranillo or Garnacha; maybe a Malbec from Argentina. The point is that I want to drink a red to complement the tomato sauce, and especially a red with some acid to match the acid in the tomatoes. That’s not too complicated, right? So let’s do the Picatta Chicken. I want a wine that can stand up to tart lemon and tangy capers, so I’ll go with a crisp, dry white. I don’t want an oak-aged wine like Chardonnay, because it won’t set off the lemon. I think I’d like a Sauvignon Blanc, or a European white. How about a Pinot Grigio? Or how about a dry Greek white? Greek cooking uses a lot of lemons, so we know it’ll work. There are other considerations, and rules of thumb that folks have discovered by trial and error. But it’s not rocket science. Say, what wine do you think they should drink on rocket ships? We’ll talk about that next time. Cheers! This is what I expect to hear when I bring up Arizona Stronghold, Page Spring Cellars, or for that matter any other Southwest winery. After all, the hot, dry desert climate is known for producing cactus, not vineyards. But there’s this little thing called “micro-climate” that I’ve talked about before, and that makes it possible to produce decent wine in Arizona, New Mexico, Colorado, or Texas. Here’s how it works. A region’s topography (hills, valleys, mountain barriers), altitude (the higher, the cooler), proximity to water (an ocean, large lake or bay), and even latitude (distance from the Equator) can combine to create conditions that are conducive to grape-growing. In southeastern Arizona’s Cochise County, 4300 feet of elevation and a large diurnal temperature shift (read, “big difference between daytime and nighttime temperatures) make it possible to grow grapes such as Grenache, Mourvedre, Sangiovese, Tempranillo and Viognier. Cochise County is also known as the last stronghold of the Apache nation — hence the winery’s name. AZ Stronghold is a collaboration between two seemingly strange bedfellows. Eric Glomski is a very respected winemaker, most recently from David Bruce Winery in Santa Cruz, California. He hooked up with Maynard James Keenan, known to hard rock fans as the singer for the band Tool. Huh? Yes, Keenan is very committed to growing great grapes and making great wine, and it doesn’t hurt that he brings a showbiz flair to the enterprise. 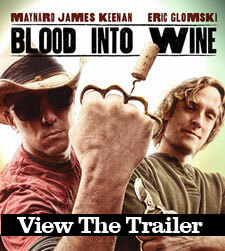 He’s produced a film called “Blood Into Wine” that’s been touring the country. Keenan also brings out a whole new crowd when he shows up at tastings and signings. That’s good! We can use some drama and theater in the wine business. So let’s get to the wine. I recently tasted Arizona Stronghold Mangus 2009: actually, I drank it with a pulled pork sandwich while staring at the Super Bowl (or the Super Bowl commercials). Mangus is the second blend they’ve released, following a Rhone blend called Nachise. (In case you’ve noticed a pattern here, the wines are all named for Apache warriors.) Mangus is the winery’s Super Tuscan blend, and includes 64% Sangiovese, 20% Cabernet Sauvignon and 16% Merlot. The Italian Sangiovese certainly leads the way in this wine. The nose hit me with bright cherry fruit and some cinnamon spice. The palate packs more bright fruit and tangy acid, combining New World softness with Old World bite. Cherry, strawberry and rhubarb all show up on the palate, but with medium body that never gets jammy or over-rich, Mangus is a great food wine. Ir was also a great wine for the occassion — all that pounding and hitting called for a wine with some punch. I know that Arizona Stronghold is now available in other states, and they’re priced between $20 and $30. Don’t be afraid to give them a try — put them in a tasting with similar varietals and see how they hold up. I think you’ll be pleasantly surprised. Cheers! View their movie at screenings across the U.S. So there are these two guys who keep popping up everywhere in the Arizona wine industry. One’s a winemaker and the other is a rock-and-roll musician, and between the two of them they’ve created three cutting edge wineries. They’re also trying to jump-start Arizona’s position in the national wine scene. I should back up here. I may have lost some of you when I referred to the “Arizona wine industry”. What… you didn’t know there was one? If you’d read my earlier post about the Arizona wine industry, you’d know there are several winemakers producing some good wines from select micro-climates in this (mostly) desert state. And Eric Glomski and Maynard James Keenan are right out in front, leading the pack and running like hell. Glomski has an impressive resume, having been co-winemaker at California’s David Bruce winery where he made Pinot Noirs that became a standard in the industry (before it was discontinued, David Bruce Central Coast Pinot Noir was one of our all-time favorites). When he went home to Arizona, he found isolated regions where the right wine grapes would do well (mostly Southern Rhone varietals) and founded Page Springs Cellars in the Verde Valley (between Phoenix and Flagstaff).